With spring break on its way bringing beautiful weather and free time for families, your kids are going to want to keep their minds busy. While there are plenty of outdoor activities for them to do this season, you’re going to want to make sure they’re staying healthy while they have fun. Berries, melons, broccoli, green beans–the possibilities are endless. So many tasty fruits and vegetables that planting with your kids will make a great learning experience. How neat would it be for them to grow in their very own garden this spring. Just imagine, running out to the backyard for a mid-afternoon healthy snack! This is also a wonderful time for them to try new vegetables they are picky about! Have your kids get creative when designing their garden. Grab some small plant pots and have the kids paint them with your favorite non-toxic paints. Consider adding glitter or jewels for a bonus charm. This is the perfect activity to add some art to your garden. Imagine how exciting it will be for your kids when the fruits and vegetables that they tended to are ready to be eaten. There are plenty of creative and healthy snack options to make with all of their favorite fruits and veggies. Try making smiley faces on their plates or creating their favorite cartoon character out of the colorful fruits and veggies. Although kids don’t exactly care for cleaning up their mess, you have the perfect chance to encourage them to be tidy and mindful of keeping the house clean. Put on some music for them to dance to while you help them declutter and organize their favorite rooms in the house. Pro Tip: Encourage your kids to tidy up by honoring them with their favorite snack or taking them to their favorite park afterward. Nature trails are fantastic for getting exercise, learning about the great outdoors, and inspiring kids to go outside and enjoy the spring breeze. 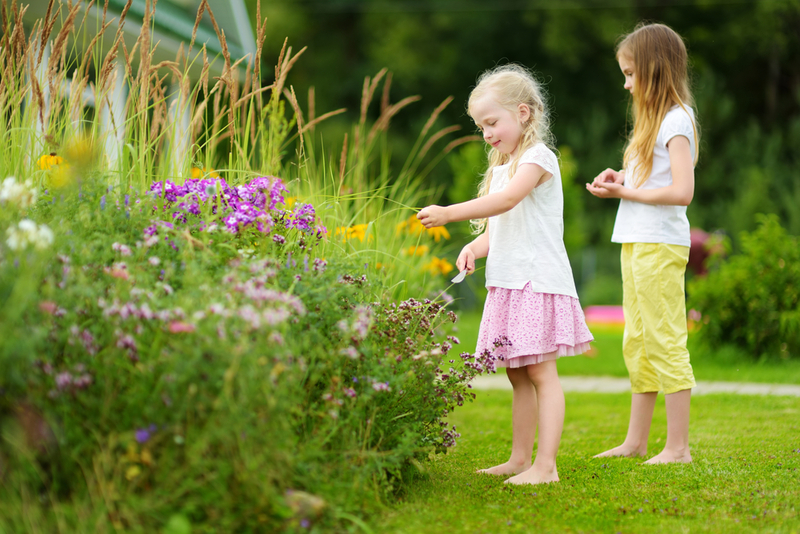 Encourage your children to look for new plants and wildlife– you could even look for wild animal prints. It’s great for all of us to get out of the house and spend some time breathing in the fresh spring air. What better way to enjoy nature trails and nice weather than by strolling through on a bike? Strap the little ones in a child seat on the back of your bike, or get them their own with training wheels so they can start learning. Swimming is a great way for the kids to use all that energy they still have by the end of the day. There are plenty of public pools at your local parks and schools that will be open as soon as spring arrives. Take a dip together or enroll your young ones in a swim class. Spring may be the time for Easter egg hunts filled with sweet treats, but you can always tie in the healthier activities above throughout the season. Get connected with us to learn more about healthy activities for your kids.